 See Montana Code Annotated 39-51-202 – 39-51-204. Under unemployment insurance, a covered employer is defined to one of the following: (1) total payroll for current or previous calendar year exceeds $1,000; (2) an employer that acquires a business already subject to Montana UI; (3) an employer that is subject to Federal Unemployment Tax Act (FUTA); an employer that employs agricultural workers and pay more than $20,000 in cash for ag labor in any quarter from the previous or current year; (5) employer that employs 10 or more ag workers in 20 different weeks during the current or previous year; or (6) employ domestic or household workers and pay more than $1,000 in a quarter of current or previous year. This definition of serious health condition is similar to federal Family Medical Leave Act. This includes: (i) continuing treatment by a health care provider that results in incapacity of more than three consecutive calendar days, such as pneumonia, surgery or broken bones; (ii) chronic conditions that require periodic visits to provider, continue over extended period, and cause episodic rather than continuing periods of incapacity, such as diabetes or epilepsy; or (iii) conditions requiring multiple treatments and recovery from treatments, such as cancer. See also, 29 C.F.R. 825.114. Wages is defined in MCA 39-51-201(25). Workers contribute less than half of one percent of their total earnings (0.451). $10 * 0.00451 = 4.5 cents. Premium estimated through program cost model created by the Colorado Fiscal Institute and adjusted by the Montana Budget and Policy Center. The Montana Budget and Policy Center. Helping people balance work and family: It’s within Montana’s reach. Not yet released. 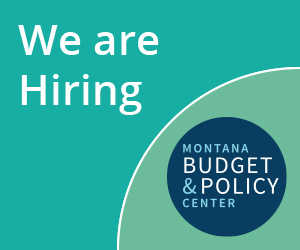 Montana Budget and Policy Center. “Paid Family and Medical Leave: Supporting Families, Business, and the Economy.” November 2015. http://www.montanabudget.org/paid-leave-report-1/. Wagner, Barbara et al. State of Montana Labor Day Report to the Governor, 2015. The Montana Department of Labor and Industry. August, 2015. http://lmi.mt.gov/media/98012/ldr-15.pdf. Reinhard, Feinberg, Choula & Houser. Valuing the Invaluable 2015 Update. AARP Public Policy Institute. July 2015 http://www.aarp.org/content/dam/aarp/ppi/2015/valuing-the-invaluable-2015-update-undeniable-progress.pdf. Meta-analysis found that turnover of an employee earning up to $75,000 annually could cost a business between 10%-30% of that original employee’s earnings. Boushey & Glynn. There are Significant Business Costs to Replacing Employees. Center for American Progress. November 2012. http://www.measuredexperience.com/content/the-significant-business-costs-to-replacing-employee-the-price-of-employee-turnover.pdf. Average earnings in Montana in 2014 were $39,880. X 10% and 30% = $3,988 and $11,964. Bureau of Labor Statistics Website. Occupational Employment Statistics. Montana 2014. Retrieved May 2015. http://www.bls.gov/oes/current/oes_mt.htm#00-0000. Appelbaum & Milkman. Leaves That Pay: Employer and Work Experiences with Paid Family Leave in California. Center for Economic and Policy Research. 2011. http://www.cepr.net/documents/publications/paid-family-leave-1-2011.pdf. Houser & Vartanian. Pay Matters: The Positive Economic Impacts of Paid Family Leave for Families, Businesses, and the Public. Center for Women and Work. 2012. http://www.nationalpartnership.org/research-library/work-family/other/pay-matters.pdf. U.S. Census Bureau. American Community Survey. Fertility Characteristics. 2013 3-Year Estimates. Retrieved May, 2015. Equal Pay for Equal Work Task Force. Equal Pay in Montana Fact Sheet. Retrieved October 2015. http://www.equalpay.mt.gov/documents/EqualPayinMontanaFactSheet.pdf.